Minding the Gap by Bing Liu, recipient of the 2018 Sundance Special Jury Award for Breakthrough Filmmaking, earned two awards at the Full Frame Documentary Film Festival this past weekend: the Audience Award for Best Documentary Feature and an honorable mention for the Charles E. Guggenheim Emerging Artist Award. Find the full list of award-winners here. "What Liu renders crystal-clear in Minding the Gap is that all his friends—and indeed, many skaters around the world and throughout time—are trying to make up for families and societies that let them down, trying to build adulthood atop childhoods they feel they didn't have." 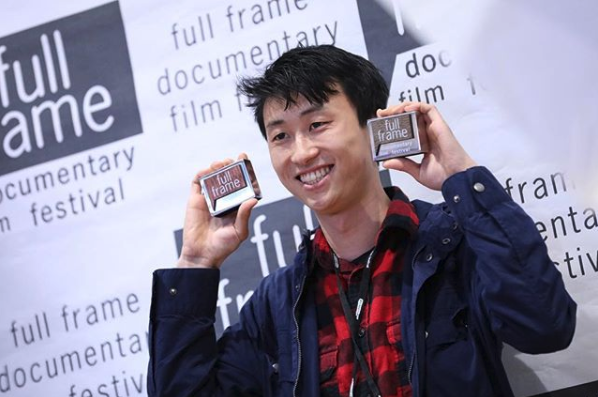 The very same day Full Frame announced their award-winners, Minding the Gap made its Chicago Premiere to a sold-out crowd at Chicago Media Project's DOC 10 Festival. Director Bing Liu, producer Diane Quon, and film participants Keire Johnson, Nina Bowgren and Kent Abernathy were in attendance, earning a standing ovation following the screening. Finally had the opportunity to attend a showing of @Kartemquin documentary @MindingGapFilm, an overwhelmingly human experience. You can't walk away from this film, it stays with you. Even if documentaries are not your thing, this one is worth to check out. Thank you Bing. The film will continue its intensive festival run this week, heading to the Wisconsin Film Festival, the Ashland Independent Film Festival, and the San Francisco International Film Festival –– to name a few. Find a full list of screenings here.